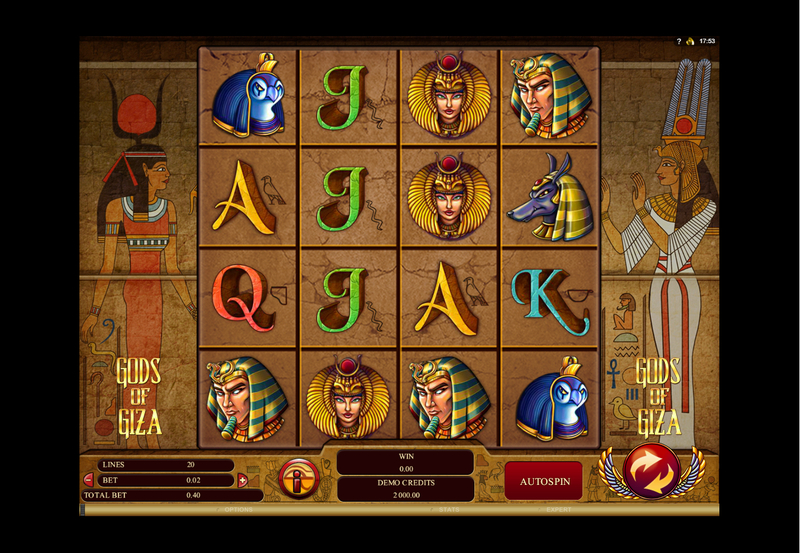 Gods of Giza slot takes you on a journey into the ancient tombs of Egypt, where the walls are covered in hieroglyphics and mysterious symbols. 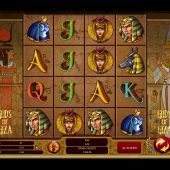 This quick paced 4 Reel, 4 row, 20 payline game offers something very different to your standard Egyptian-themed slots such as Cleopatra Plus or Pharaoh's Treasure. The powerful bonus shakes the tomb to its core as you rotate the reels! The main bonus offers 8 Free Spins with the unique rotating reels feature, presenting more winning opportunities. As each free spin takes place, the reels will rotate 90°. This has the effect of moving the symbols to create new winning lines. Reels can rotate up to four times, completing a full 360° rotation and giving you up 4 chances of a decent winning opportunity. Gods of Giza is typically accessible through Mocrogaming's Quickfire platform, as many other Genesis titles are, such as Oriental-themed slots Wu Xing and Rise of The Empress.